Those, who want to just quickly realize one or more copies of a specific circuit or make a field test, those fellows will be most certainly customers of the Bungard Elektronik – universities, engineering companies, service providers but also development departments of large production companies – shortly everybody, who designs printed circuit boards. At the beginning of the 60 years company founder Heinz Bungard in Leverkusen considered opportunities for further development in the young industry of printed circuits. It was his idea to equip the copper sheet of a pcb with a UV-light sensitive fotocoat and so he is considered to be one of the inventors of the world-wide-known presensitized PCBs. The Presensitized Base Material is still the major column of the Bungard product portfolio. In addition, the company has developed into a reliable and important partner as a supplier for the PCB manufacturing companies. When Bungard started production and distribution of the Presensitized Base Material, they were already thinking about supplying small-scale processing equipment for all customers of the Bungard base material. This market segment was so far totally ignored; e.g. 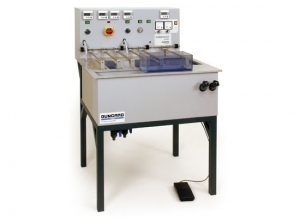 it was impossible to obtain small etching machines or exposure units. With this idea any manufacturer of designs, prototypes or small series was now capable to produce fast, flexible and above all, error-free PCBs in-house. This was reflected even then in the slogan: “In the morning on the drawing board, at noon already done – with original Bungard Presensitized Base Material”. The company’s founder gave his word with his name and his experience for the quality of original Bungard Presensitized Base Material. Only top quality materials, tested and approved by all usual standards, are used. A broad range of materials such as FR2, CEM1, FR4 and PTFE in various board thicknesses and with different copper clads are offered. From 570 mm x 1150 mm wide boards all standard and special sizes down to a minimum of 50 mm x 50 mm are cut. For the photocoat a high quality positive liquid resist is used, made according to a Bungard owned recipe. The resist features highest exposure sensitivity, short processing turns and large safety tolerances. To paraphrase an advertising slogan: The plates are “indestructible”. Based on the experience with presensitized PCBs, Heinz Bungard extended his product range. In 1981 he started selling aluminium panels, which were eloxized in a special treatment sequence and then coated with a positive photo resist. Alucorex, so the new product’s name, aimed to make manufacturing of front panels, signs, as well as pad printing cliches significantly easier.